. The standard, promoted by the ruling party, tries to stop the advance of the travel platform and unauthorized transfer services, such as the use of school buses by piqueteros. One of the most important changes is the possibility to withdraw the license and eliminate people who have been found to be in violation. In addition, fines of up to $ 178,500 are maintained. The change of law, promoted by the ruling party, is part of the permanent attack of the city on the mobile application that allows traveling with private drivers, which is considered illegal because the transit code only permits travel by means of signs in the street or a radio service. The government of Buenos Aires is in line with the guilds of taxi drivers, who reject Uber as unfair competition and have committed violent acts against cars and drivers. Of this legal reform, when the card is kept, the driver receives a form for 72 hours; It will be returned to you when you pay the corresponding fine. Meanwhile, the disqualification will be for a period of between seven and 30 days. The sanctions also reach motorcyclists who circulate without relevant documentation or transfer minors under the age of 16. The law was approved with 37 positive votes contributed by Vamos Juntos and the Peronist Bloc. Eleven delegates voiced against and nine more deputies abstained. 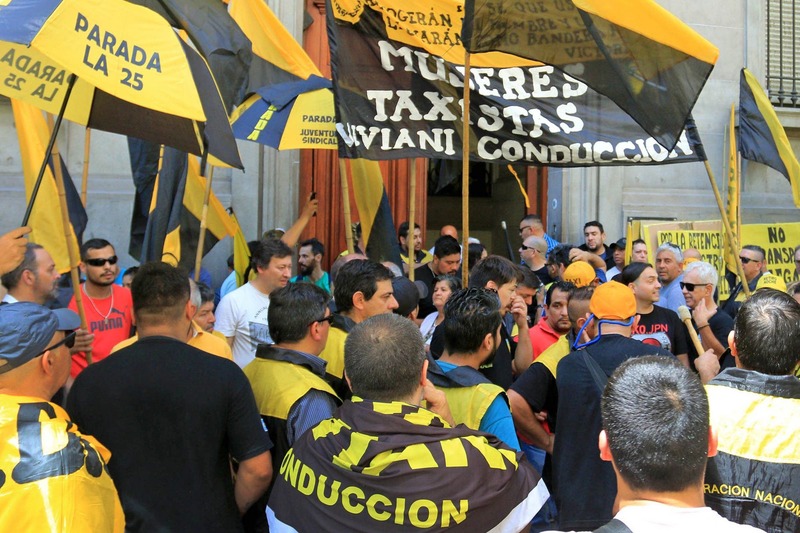 As the changes were discussed, hundreds of taxi drivers in different groups again mobilized for the legislative power in Buenos Aires to express their support for the sanction of the norm. The drivers had gathered at 10 o'clock in different parts of the capital and at 11 o'clock they marched in their vehicles to the outskirts of the Plaza de Mayo, which led to the blockade of Avenida Diagonal Sur. Among the banners were those who, in addition to the fines against Uber drivers, asked for the control of the movement of vehicles to detect the thousands of people working with their cars on the application. The platform has been available in Buenos Aires for two and a half years and continues to function despite various court rulings that have been made because of the success achieved among residents of Buenos Aires. According to data provided by Uber, there are one million active users per month and only in the last three months 55,000 people had profits for the company. As it happened in other countries, Uber stepped outside the current regulation in the capital. The same method used in all cities of the world, where it now works normally after different conflicts (see separate). it promoted complaints to the courts and also road vehicles of vehicles to detect and seize cars in the service of Uber. The taxi drivers' unions also went to court to request that the activity carried out by the drivers belonging to the platform be declared illegal, escalating to the Supreme Court of Justice, with an unfavorable ruling for the groups. On the other hand, however, there are open files against the company and its directors for tax evasion and other charges. regulated the operation of the platform, the approval yesterday in the legislative power of Buenos Aires has rekindled the controversy. "Pro legislators voted to prosecute and fine those who deal with Uber, but during the previous debate it became clear that, more than two years after Uber's arrival, the city owes a dialogue that includes everyone who chooses to travel and manage with applications, via social networks, more than 100,000 people have expressed themselves in the same sentence ", they said in a press release from Uber. "Our commitment lies with drivers, users and mobility in the city, we will continue to work to give the people who choose us the best service, provide the source of income for those who decide to go out and defend their rights, we continue to look for modern regulations, and Mendoza and hundreds of cities in the world show that technology offers mobility solutions and economic opportunities, "they said. "As long as Uber does not fit into the legal framework, we are obliged to exacerbate the sanctions, we are open to discussions when there is a will to fall within the law." Other companies understood that this was the way ", considered the first vice president of the Buenos Aires Act, Francisco Quintana (Vamos Juntos). He added: "With the modification of the transit and transport code, we are trying to offer more tools for the control of public transport and thus guarantee the safety of the neighbors, we have also decided the penalties for school transport that the activity does not they are intended to discourage their use in marches and pickets. " The lawmakers were on the left side among the opponents. "The measure is difficult and flawed because the government, instead of sanctioning Uber, a huge outsourcing and labor precarious company, imposing sanctions on employees, who carry out the task of getting the necessary income together to make ends meet "Gabriel said. Solano, from the Workers' Party. From the Citizen Unit block, they also considered the reform project as "a political pitfall" because it does not offer a solution for companies that are unreliable from tax and their fiscal responsibilities ". in 2013, but after various legal controversies, it is only available today in the most expensive version, UberBlack. As soon as the app landed in the country, the very strong lobby of the taxi drivers explained the war and after several remedies, UberPop managed to block the entire peninsula. The company expects, however, that there will be an "aggiornamento" of the sector's regulations to introduce cheap transport services. UberBlack is a service that is rented with a driver (as if it were remittances), which are very limited in the country because the number of licenses is limited. in October 2015 and in a short time he was successful with the customers. The guild of taxi operators rejected the arrival of the service and there were episodes of violence against Uber service vehicles. At the end of 2016, Montevideo arranged the passenger transport applications and Uber drivers had to submit to a regulation that included the payment of taxes. In December 2017, the company started working in Punta del Este, without any regulation, but with a certain tolerance from the authorities because the taxi service was not enough; Now they are working on a regulation. mid-2014; first in San Pablo and Rio de Janeiro, and later it spread to more than 20 cities. From the beginning, as in other parts of the world, there was a strong resistance from the taxi drivers' associations, with strikes and even cases of aggression drivers from Uber cars. At the end of that year, the authorities found that the new service was not illegal activity, but indicated that it should be regulated by every municipality, with registration of drivers. At the start of 2018, a federal law established a national mobility policy for the city that provides for this mode of transport. They resist their regulations with marches, street attacks and even clashes with drivers and Uber customers. He then added two variants: Uber Black, with luxury cars & Uber Pool, to share the journey (and costs) between users. In 2015, the government of Mexico City announced a regulation for the use of private transport services that were requested through applications; It was the first capital that made these platforms possible.
. Motivated by the protests of taxi drivers debates on a bill to regulate its operation, including Cabify. The initiative includes the obligation for drivers to have a professional driver's license and not to have a criminal record. Moreover, it has been established that the platforms must be set up as a paid passenger transport company and must pay taxes. The drivers must take out liability insurance for the passengers.